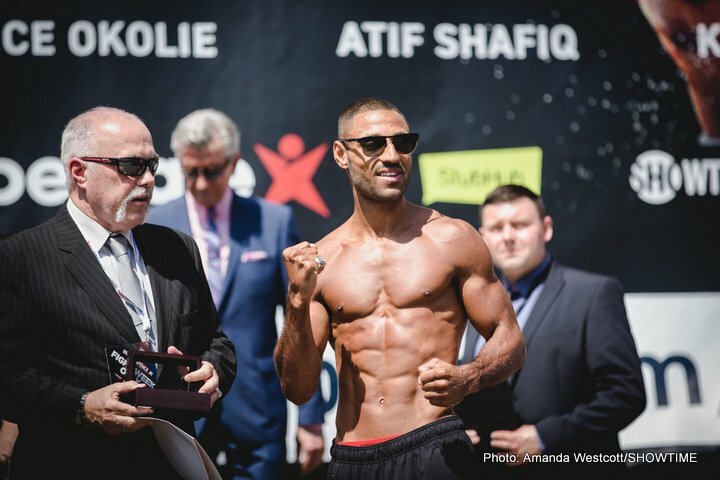 British promoter Eddie Hearn appears to be counting his chicks before they’ve hatched with him talking up a much hoped for fight between his fighter IBF welterweight champion Kell “Special K” Brook (36-1, 25 KOs) and former light welterweight champion Amir “King” Khan (31-4, 19 KOs) for later this year in the UK if Brook can get past mandatory challenger Errol “The Truth” Spence Jr. (21-0, 18 KOs) tonight in their fight at Bramall Lane in Sheffield, England. Hearn wants the Brook vs. Khan fight to happen. Khan seems to want the fight too. The problem is Spence stands directly in the path of the mouth-watering Khan-Brook fight to happen. Spence has already said he’s not going to let the judges have any say so in the outcome of this fight. It’s unclear if this an attempt at gamesmanship by Hearn in trying to show Spence that he thinks so little of him as a challenger that he’s already thinking about Brook’s next fight. If that’s the case, I think it’s going to be a fail. Spence isn’t the type that is going to underachieve just because he’s being overlooked by a promoter that sees a huge fight over the horizon. Brook is the underdog in tonight’s fight against Spence for good reason. He’s coming off an eye injury, a beat down at the hands of middleweight champion Gennady “GGG” Golovkin, and he had to take off a ton of weight. There are a lot of things going against Brook in this fight. He doesn’t have the experience, power or the talent to beat Spence. To be sure, Brook has a lot of fights under his belt in his 13-year pro career, but he’s only fought 2 good opponents of the 37 fights he’s had. The experience isn’t there for Brook. “Amir will be there tonight and I expect him to be vocal after the fight,” said Hearn to skysports.com. “For us it’s all eyes on Spence but of course that fight [Brook vs Khan] remains one of the biggest fights out there,” said Hearn. There’s rumor that Khan will be brought into the ring tonight after Brook’s fight with Spence so that Hearn can announce the fight between them. It won’t work quite as well though if Brook is knocked out or soundly beaten by Spence tonight. I don’t think the impact of Hearn standing in the center of the ring announcing a fight between Khan and Brook will be the same with Brook having been knocked out tonight instead of him winning. If you thought the booing of Hearn was bad after the Anthony Joshua vs. Wladimir Klitschko fight at Wembley Stadium was bad, just wait and see how Hearn is booed if he announces the Brook-Khan fight tonight if Brook loses to Spence. I’m hoping that Hearn doesn’t do anything foolish like that. There’s a time and a place to announce the Khan vs. Brook fight, and I don’t think it would be tonight if Brook comes up short against Spence. The fight between Khan and Brook really needs to happen soon because both of these guys are just hanging on and likely not going to last too much longer as top fighters at 147. You can argue that Brook shouldn’t even be the IBF champion with the way that he fought Porter 3 years ago. Brook never gave Porter a rematch. Hearn has matched Brook against beatable guys at 147 ever since in putting him in with Jo Jo Dan, Frankie Gavin and Kevin Bizier. Porter was passed over by the International Boxing Federation with them choosing to rank Bizier No.1 rather than Porter. It was perhaps lucky for Brook that he didn’t have to fight Porter a second time because he would have problems if he fought him a second time. Khan-Brook fight can still happen even if Brook loses tonight to Spence. There’s nothing stopping the Khan vs. Brook fight form being made. I don’t know if Khan will want to take on a fighter with 2 straight losses in Brook. If Brook gets stopped tonight due to his trainer throwing in the towel again, I don’t know how Hearn an sell that fight to the British boxing public. Does Hearn stubbornly make the Khan-Brook fight, hoping that the casual boxing fans won’t have clue one that Brook has lost his last 2 fights and Khan having lost his last fight as well. Moreover, it’s unclear whether there is still a lot of interest in a Brook vs. Khan fight. Khan hasn’t fought in 1 ½ years, and he’s not won a fight since 2015. Khan’s boxing career has been sinking since 2012 when he was beaten by Danny Garcia for his second straight loss. The previous year, Khan had beaten by Lamont Peterson. “Come back to Britain, put on a big show, and beat someone like Kell in a rivalry fight,” Khan said to skysports.com. “Who is No 1 in the division in the UK? People don’t know who to pick, so let’s prove it,” said Khan. I get the feeling that Khan is no longer interested in waiting on the Brook fight. Khan doesn’t have a lot of big money options following his 6th round knockout loss to Saul Canelo Alvarez in 2016. If Khan doesn’t take the money fight against Brook now, he may never be able it. For the Brook-Khan fight to be big, it will need for Brook to beat Spence tonight, preferably without controversy or without him bending the rules like we saw in his fight against Shawn Porter with him holding every chance he could get.